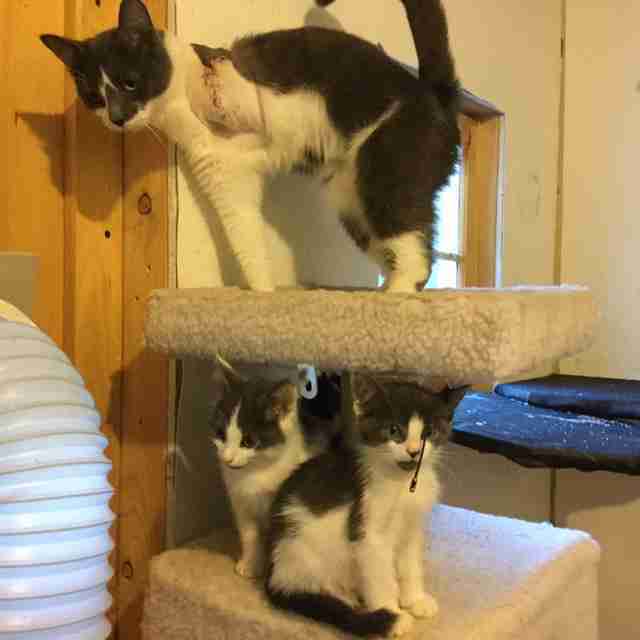 When his son died in a motorcycle accident, he found some kittens who helped him heal — and changed his life forever. Chris Arsenault has always loved cats — but in 2006, they became his life. That year, Arsenault tragically lost his son, Eric, in an accident after his motorcycle malfunctioned. While Arsenault was still devastated from the loss, he stumbled upon a colony of 30 sick cats and kittens who were living outdoors near his neighborhood in Long Island, New York. He took the cats into his home to nurse them back to health — and found that they gave him some much-needed love and comfort. A retired train conductor, Arsenault had plenty of free time to start converting his home into the perfect place to care for injured or sick stray cats. 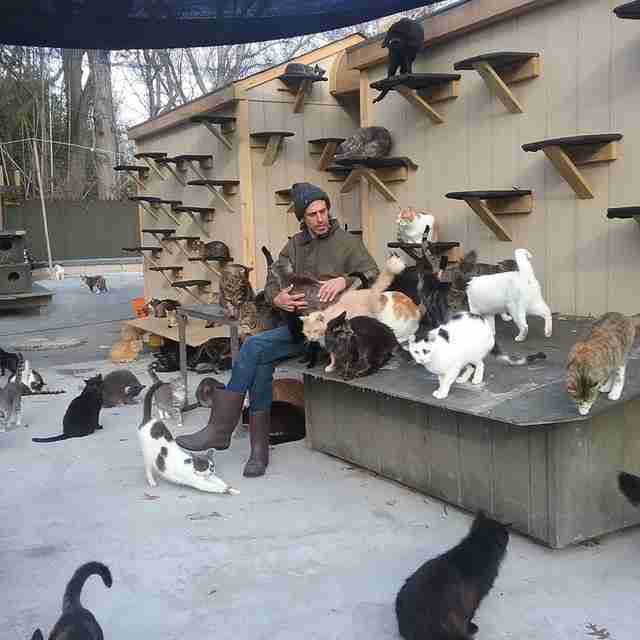 He named it Happy Cat Sanctuary, and began getting calls from concerned locals whenever they spotted a cat in need. 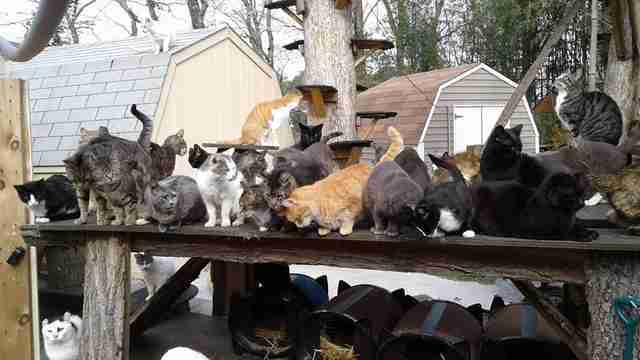 Within the sanctuary’s first few years, Arsenault was caring for nearly 70 cats at a time. While some of the cats could be adopted out, many were semi-feral — meaning that they weren’t exactly “pet material,” but also couldn’t survive on their own since they depended on people for food. 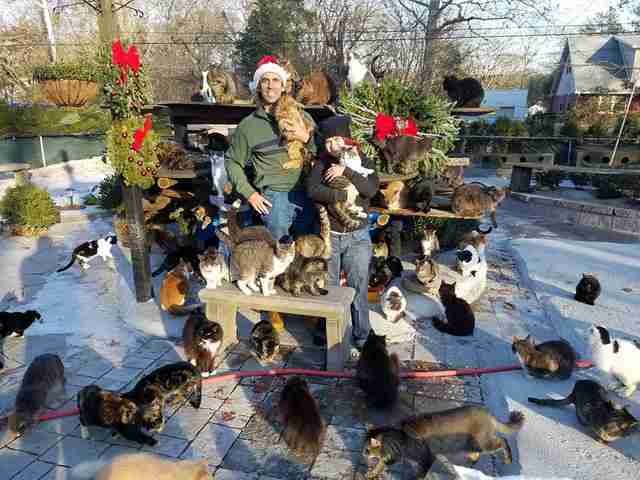 Two years ago, an anonymous patron donated $200,000 to the sanctuary, allowing Arsenault to renovate and expand the facility to allow space for more cats. 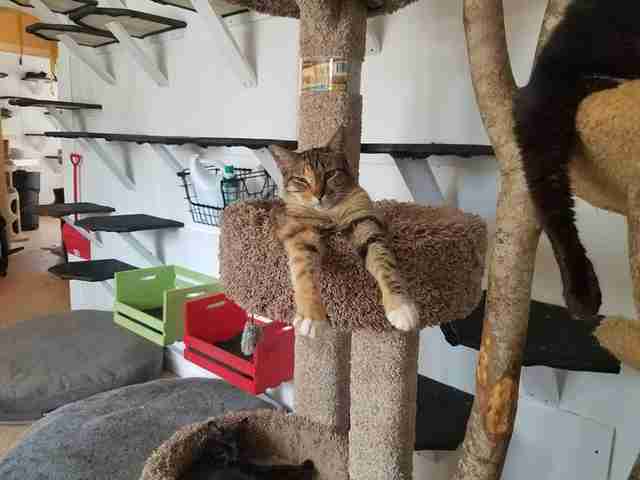 It now consists of a large main indoor cat house, multiple smaller huts that are heated or air-conditioned, and a large, cat-safe, fenced-in yard outside with various tree structures and hammocks. 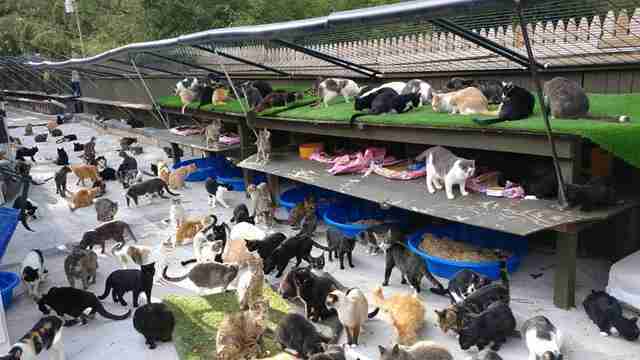 There are currently around 300 cats living there, who can roam wherever they please when the weather permits. 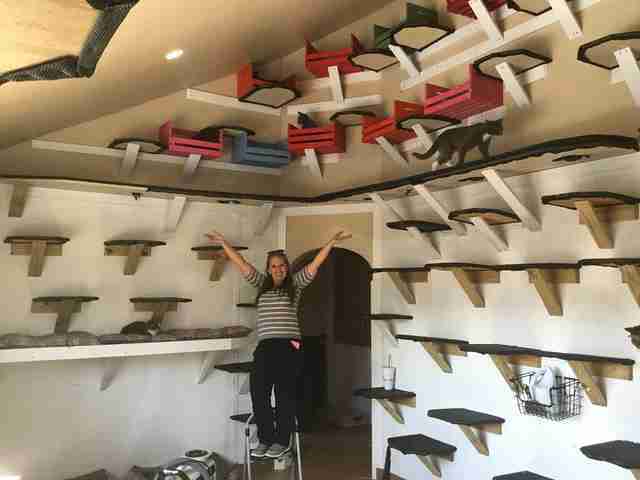 And luckily, with the help of several employees, the cats are as happy as can be. Each day begins around 7 or 8 a.m. Arsenault arrives to begin cleaning out litter boxes and water dishes from the night before. Breakfast follows soon after — and it’s clear the kitty residents are used to their daily routine. In addition to the free-roaming space, the sanctuary also has a medical ward to give any sick or injured cats the extra space and attention they need to recover. Over the years, Arsenault has taken in cats with medical issues ranging from feline immunodeficiency virus (FIV) to injuries resulting from being hit by cars or used as bait in dogfighting rings. Some have even been brought in after being poisoned or shot at by people. While many have suffered trauma or have special needs that would make it difficult for them to find the perfect forever home at a traditional shelter, they will always have a place at the sanctuary. In addition to the lifesaving care Arsenault arranges for the cats, he also manages a “trap-neuter-return” program which has significantly decreased feral cat populations throughout New York’s Suffolk County. Over the years, Arsenault has helped place hundreds of homeless kittens and cats into their forever homes — and given a safe haven to thousands of other cats who prefer the free-range sanctuary life. 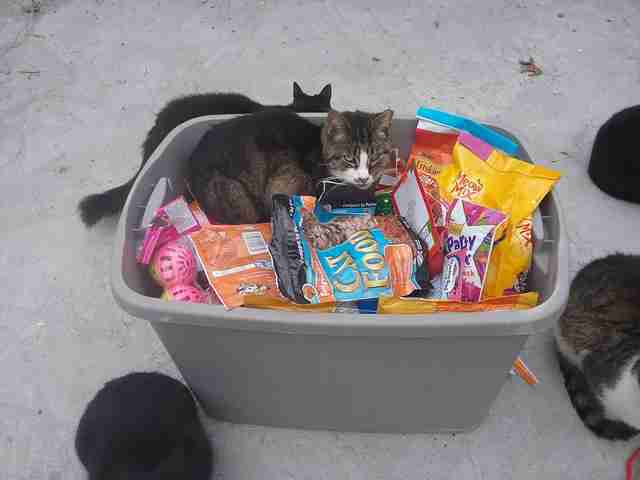 To support the continued care of cats living at Happy Cat Sanctuary, you can make a donation. You can also like the group on Facebook.